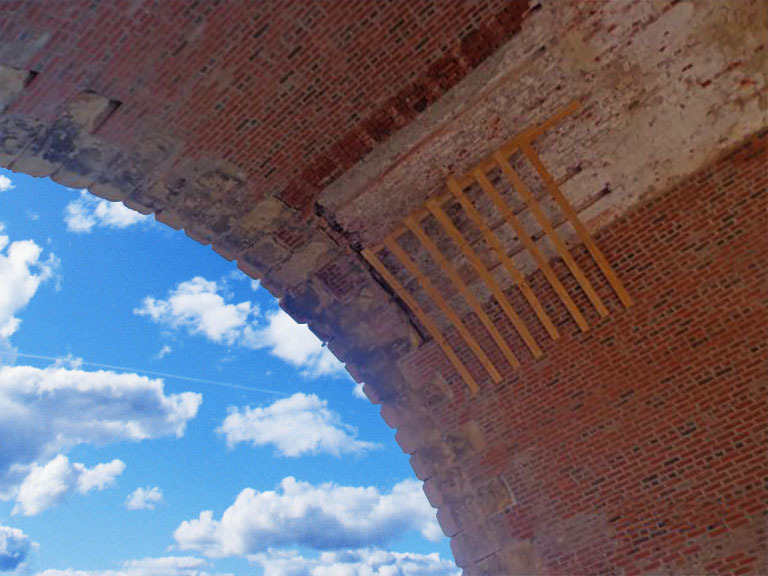 The iconic Eads Bridge crossing the Mississippi River between St. Louis, Missouri and East St. Louis, Illinois was the first steel structure bridge of its kind in the United States when it was designed by James B. Eads and opened on July 4, 1874. 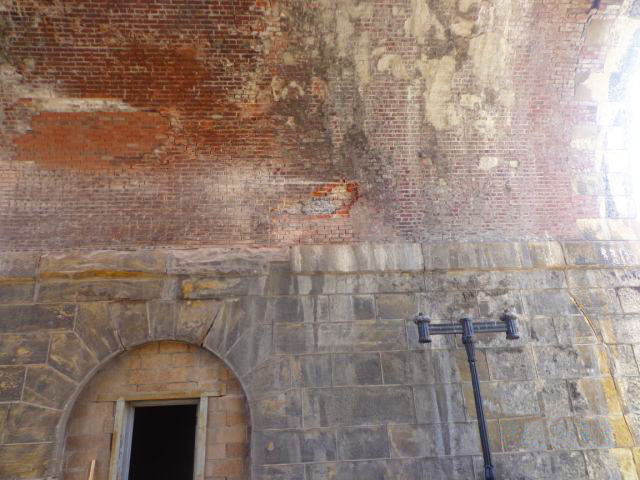 A significant engineering feat for its time, the historic bridge was in desperate need of rehabilitation from decades of use, repairs and environmental exposure. 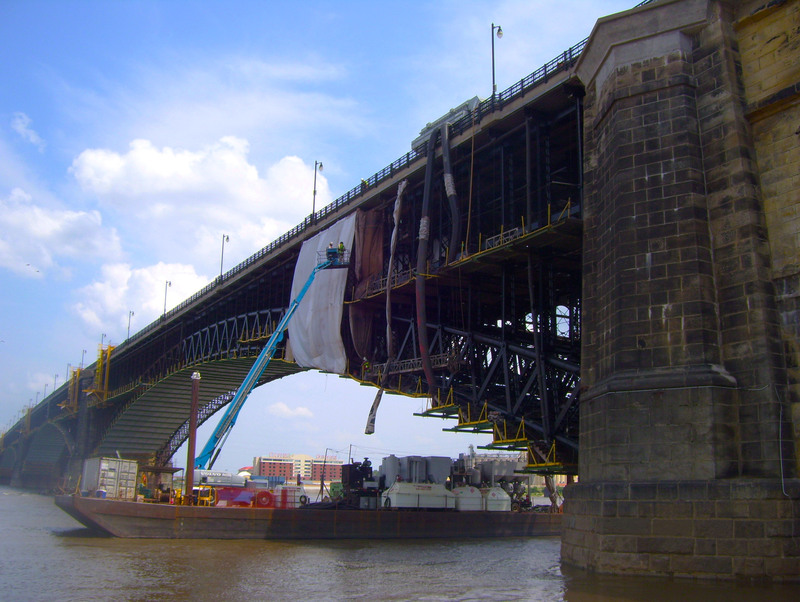 In May 2012, the Bi-State Development Agency/Metro (BSDA/Metro) launched a monumental Eads Bridge Rehabilitation project, largely funded through $34 million in federal support, which includes $25 million from American Recovery and Reinvestment Act (ARRA) funds. All phases of the project are scheduled to be completed in 2016 and expected to extend the life of the bridge by 50 years. The top deck of the bridge which supports vehicle and pedestrian travel is owned by the City of St. Louis. BSDA/Metro owns the superstructure and the lower deck which is the rail deck that supports the region’s MetroLink light rail system. 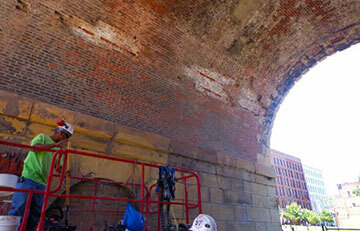 Restoring the brick archways under the bridge that support its foundation. 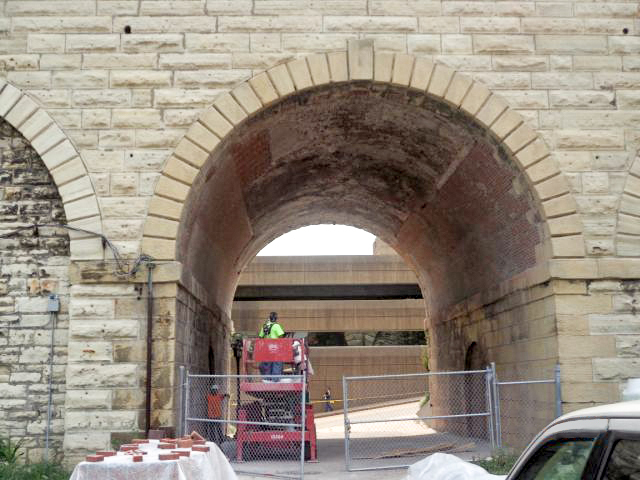 St. Louis Bridge Company, a large bridge company working throughout the Midwest, hired Western Specialty Contractors – St. Louis Masonry Restoration Branch, as a subcontractor on the project due to Western’s past expertise in bridge work. Western’s scope of work focused on restoring the bridge’s brick archway supports on the Missouri side, which are located about 100 yards from the waterfront and allow roadway traffic under the bridge. 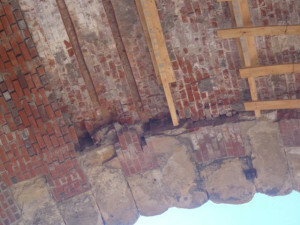 Tuckpointing of all deteriorated mortar joints. 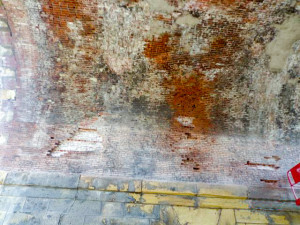 “We were contracted to remove and replace 1,256 square feet of bricks and tuckpoint 1,256 square feet of mortar joints. 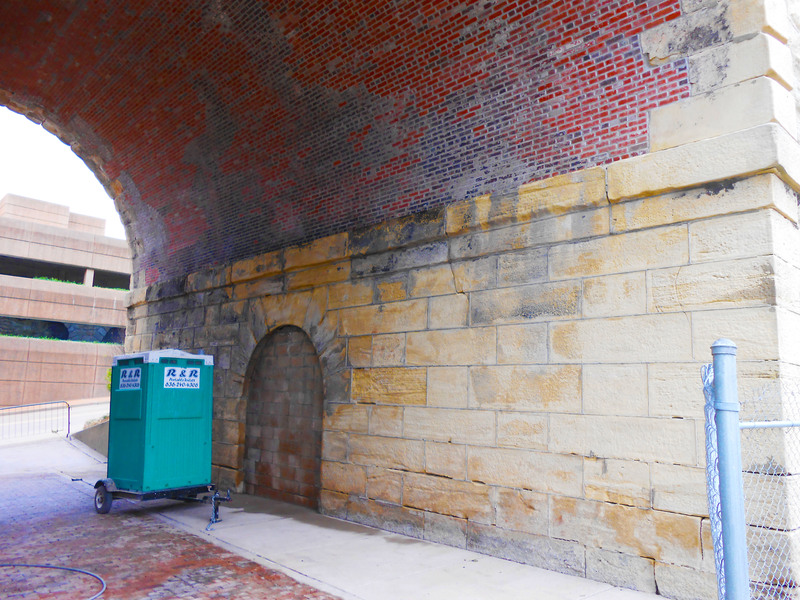 We ended up removing 1,824 square feet of bricks and tuck pointing 469 square feet of bricks,” said Western Department Manager Rick Kerperien. One of the challenges that Western’s crews faced on the project included installing bricks in the overhead arches, which reach 30 feet high at their centers. Western found an innovative solution to the vertical challenge. 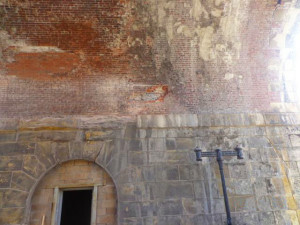 “We overcame that obstacle by cutting wood strips and anchoring them to the arch ceilings which would hold the new bricks securely in place while being installed. 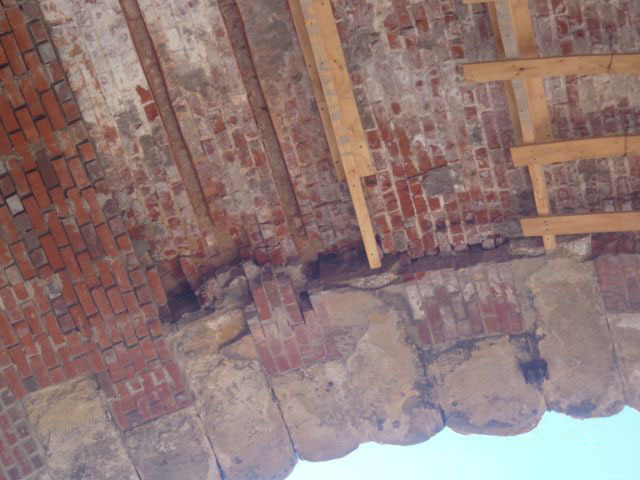 Once the bricks cured, we would remove the wood strips and fill in the holes where necessary,” Kerperien said. Western crews also had to bring in water for mixing the mortar and cleaning, and used generators for electricity on the project. Western’s phase of the project was completed in four months.